There is no memory as vivid to any parent as the day they get to meet their child for the first time. It’s the day all the anticipation comes full circle and they hear their child’s first cry into the world pierce the silence. The complications towards the end of my pregnancy made her cry even more monumental for me and even more reassuring that our beautiful girl was here. I finally got to hold her, see those beautiful red curls and soak in those 10 tiny toes and fingers — my little sunshine mixed with a hurricane was here. Those first weeks home were as beautiful as they were difficult. While most newborns sleep, our daughter had difficulty, sleeping no more than a two-hour stretch at a time. While most newborns build an appetite and yearn to eat, our daughter would eat for minutes at a time and then cry with frustration and discomfort. We were at a loss and had many questions, but we were assured at each of her appointments that she was healthy and this phase was all a part of being an infant. As weeks turned into months and sleep and eating continued to prove difficult for her, we had many appointments. There were many discussions on colic, acid reflux and allergies. 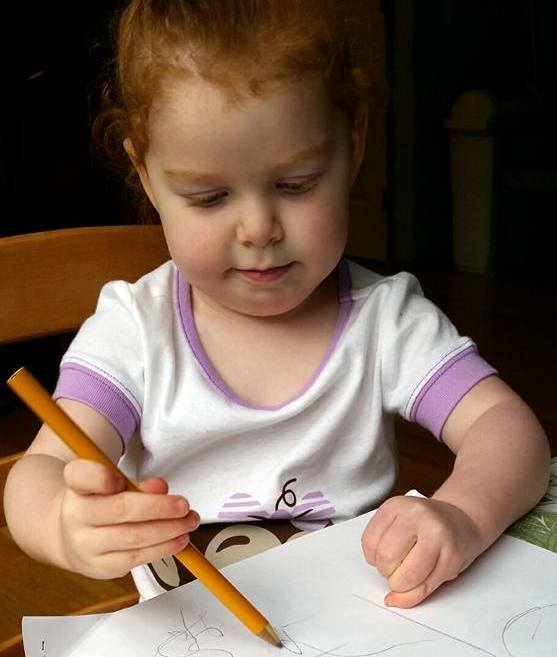 We sought support from lactation specialists, therapists trained in reflux and made countless morning calls to her pediatrician to be seen that day after a horribly hard night. All attempts proved futile with the constant reassurance that she was healthy. As my daughter began taking notice of toys and figuring out her world, I started to notice that she never unclenched her left fist. I had to try with all my might to get her little thumb out of her fist to introduce toys to her left hand or to clip her nails. It was strange to me, but I didn’t have enough knowledge to be overly concerned. At first, we believed she was born to be a righty. When she continued to disregard her left hand in play, I became scared that her arm or a nerve may have gotten hurt during delivery. It was at her six-month checkup that her pediatrician agreed with my concern. Something was preventing her from using both hands. My concern of injury was met, but he added to my concern by sharing the rare possibility of a stroke — words that, no matter how hard anyone tried to explain away the rarity of it, I couldn’t get out of my mind. A child having a stroke — how is that even possible? We had a month of waiting to be seen by a specialist who performed a sedated MRI. We had to wait what felt like an eternity to get those results. In that time I had poured over Google to scour for every possibility and every relatable story. I drove myself to the brink of anxiety, questioning myself, my pregnancy and any new behavior my daughter showed. I was lost, overwhelmed and scared. Friends and family tried their best to reassure me, to help calm my feelings by saying everything would be all right and that there must be an easy explanation. When the call finally came and the doctor shared the results from the MRI, there was nothing easy about the explanation. Her words came across in slow motion, indicating the results reflected a stroke. We had made an appointment to talk face-to-face and go over her scans, but the call left me in shock. The relief I had hoped to feel, after months of knowing something was wrong, wasn’t there — only new questions and huge emotions to struggle through. 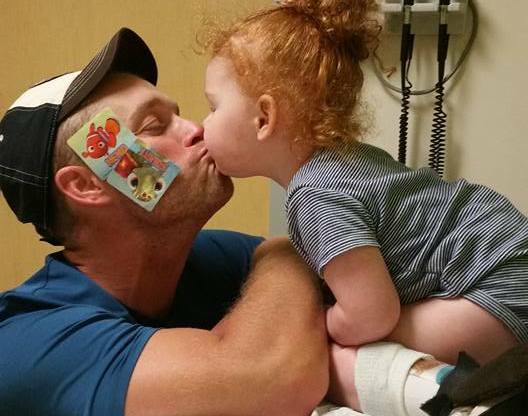 The following week we sat together huddled over a computer screen with the neurologist, scared and unsure of what all this meant for our little girl. The doctor began the discussion by saying that a stroke can happen at any age and that the risk during the newborn period happens to be the highest risk throughout our lifetime. One out of 4,000 newborns, and my little girl was that one. The room began to fill with words and terms: hemiplegic cerebral palsy, ischemic in-utero stroke, feeding therapy, disability, adaptive equipment. As much as we braced ourselves and as hard as we tried to retain it all and build a plan, the moment was surreal. The doctor began to show each scan from her MRI — different angles and “slices” of images taken of my daughter’s brain. There were more terms and more uncertainty until she paused on one image — an image from my daughter’s chin up to the top of her head. It wasn’t the dark void in the image on my daughter’s right side of her brain that I focused on anymore. Now I could see the outline of her little face, the way her chubby cheeks left an outline even in an X-ray, and there she was. In that moment among the fear and uncertainty, I was grounded, brought back to my senses that no matter what we could come to learn about this diagnosis, it did not define my daughter. She was still right there. My little sunshine mixed with a hurricane. It’s been three years, and not only have we learned so much about stroke, but we also learned that we have to take it one day at a time. To say it has been easy would be a lie. To be completely transparent, there have still been moments of feeling lost in emotion and worry. It’s human and it’s part of being a parent. I talk to families often that ask when it will get easier. That’s an answer that’s different for all of us. For me, I remember that moment in that room where I found my grace again, and I hang on to that as tight as I can knowing it’s going to be OK.
To find out more about pediatric stroke or to connect with other families in support, visit pediatricstrokewarriors.org. The Mighty is asking its readers the following: Share with us the moment, if you’ve had it, where you knew everything was going to be OK. If you’d like to participate, please send a blog post to [email protected] Please include a photo for the piece, a photo of yourself and 1-2 sentence bio. Check out our Share Your Story page for more about our submission guidelines.